The Oxford-Indonesia Forum 2015 (OX-ID Forum 2015) is a pioneering event initiated by the Indonesian Students’ Association in Oxford (PPI Oxford) that aims to raise awareness in the international community of the emerging issues in Indonesia. More specifically, these issues will centre on the theme of ‘Nature, Culture, and Adventure’, given its relevance to the country’s profile and potential development challenges in the future. 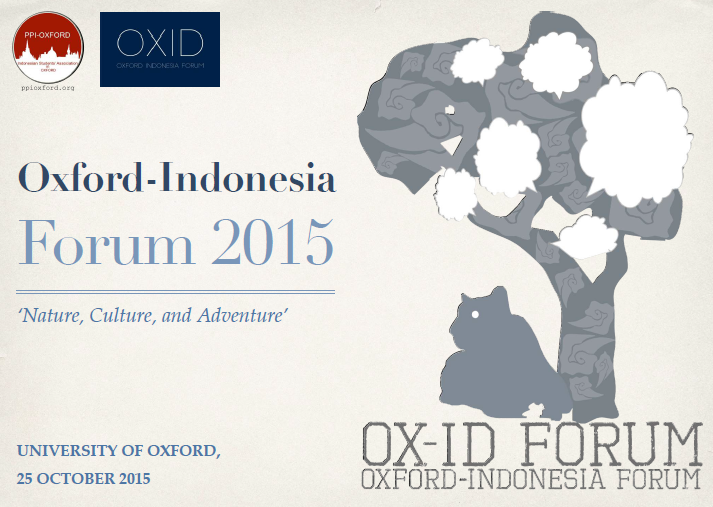 OX-ID Forum 2015 is scheduled to be held on SUNDAY, 25 OCTOBER, 2015*, at the UNIVERSITY OF OXFORD, and expects the attendance of the 6TH PRESIDENT OF THE REPUBLIC OF INDONESIA, PROF. H. SUSILO BAMBANG YUDHOYONO. The event is also due to be opened with recorded welcoming remarks from the PRESIDENT OF THE REPUBLIC OF INDONESIA, IR. H. JOKO WIDODO. OX-ID Forum 2015 is fully supported by the AMBASSADOR OF THE REPUBLIC OF INDONESIA FOR THE UK AND REPUBLIC OF IRELAND. This programme will give the opportunity for OX-ID Forum 2015 attendees to relax after a day-long panel discussion and will bring together all the panellists, industrial experts, and honored guests to network and make useful contacts in a friendly dining atmosphere. As mentioned, this programme also serves as a fundraiser activity toward the sector that aligns with the overall theme of the Forum. Closing remarks and photo session. Overall, it is only reasonable for us to raise the topic of ‘Nature, Culture, and Adventure’ at the OX-ID Forum this year. It is hoped that this groundbreaking initiative between the Indonesian scholars and the University of Oxford can lead to productive discussion and, more importantly, innovative solutions to the growing issues around this subject. In the long run, we seek to make a more tangible contribution to the cooperative ties between Oxford and Indonesia as well to Indonesia’s development processes by establishing a centre for Indonesian studies in Oxford.